Take part in the Dish of the Day promotion at 32Red Casino and you'll never go hungry. The popular Dish of the Day promo specials will have you salivating. The 32Red Casino Dish of the Day promo is hugely popular and offers players a huge variety of fulfilling bonuses that are designed to make sure that all players get the most out of their bonuses. What's more, these special offers are available every day of the week. Players can use the daily bonus treats to enjoy all the amazing games 32Red casino has to offer. Play some of the best Microgaming slots like Immortal Romance or Thunderstruck II, or enjoy exclusive titles like Ant & Dec's Saturday Night Takeaway™. You'll even find great table games like roulette and blackjack. No matter what casino games you like to play, you can use the Dish of the Day promotion to enjoy them even more. The promotion is available right now on desktop as well as the mobile version of the casino software. 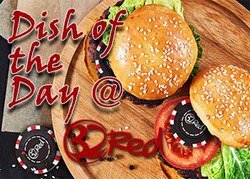 Taking part in the Dish of the Day promotion at 32Red Casino is easy and all you have to do is follow the simple instructions. Make your deposit and the bonus will automatically be added to your account. The bonuses are added using 32Red Casino's fair play bonus system which means there are no restrictions on when you can withdraw your winnings. You will, however, forfeit the bonus if you withdraw your winnings before you meet the wagering requirements. There are terms and conditions for the Dish of the Day promotion and if you need any help you can contact the support team 24/7. You can only claim one offer each day and if you are eligible for the promo, you will see it in your site notifications when you log into your account. You have to make a deposit for each bonus you claim every day. The full list of terms and conditions can be found on the casino's promotions page so be sure to check them out. The Dish of the Day promotion is now available at 32Red Casino, so if you don't already have an account be sure to open one. New players to this online casino can take advantage of the world famous signup bonus at 32Red. When you create a real money account you'll receive $32 for every $20 you deposit up to $160 free. The wagering requirements are set at 50x and there are different game contributions. Slots, keno, and scratch cards contribute 100%, table poker games are 50%, roulette is 20%, and blackjack games are 10%. There are plenty of great promotions to sink your teeth into at 32Red Casino too including the Dish of the Day promotion, Red Ruby Rewards, Live Roulette and Live Blackjack promotions, and more. Be sure to check out the site for more information and to get your hands on some free casino money.